I was part of the baby-boom generation entering Wake Forest University in early fall of 1967. During the next four years, the world beyond our cloistered campus would be gripped by unprecedented social and political convulsion: race riots, war protests, the Tet offensive in Vietnam, Martin Luther King Jr.’s assassination, Robert F. Kennedy’s assassination, the Cambodia invasion, Kent State, LSD, Woodstock. I’d like to say that we were among the vanguard of the student movement calling for peace and justice, but that was not the case. The turmoil sweeping other universities largely bypassed Wake Forest, secluded as it was among trimmed lawns and leafy magnolias several miles from downtown Winston-Salem. Our student body was largely conservative — a campus poll revealed that a 2-to-1 majority of my classmates supported Richard Nixon for president in 1968 — and not until our senior year, with the draft breathing down on the males, did you begin to see more teach-ins and protests at the school. After wandering aimlessly from course to course my first two years I settled on English as a major. The department’s professors were inspiring. I was one of the lucky ones to sit in the British romantic poets class taught by Edwin Wilson (’43), who also served at the time as the University’s provost. Brimming with enthusiasm, Ed Wilson brought the words of Wordsworth, Byron and Yeats to life for me. I left each class convinced I wanted to be a poet and at one point confided this desire to Elizabeth Phillips, an Emily Dickinson scholar who introduced me to American writers. After reading my papers, Professor Phillips, ever so gently, suggested I pursue another line of work. Good advice. I would have starved as a poet. There were also teachers at Wake who made me question what I thought I believed — as they should have. The Christian ethics class G. McLeod Bryan (’41, MA ’44) taught left me troubled over church hypocrisy. Jon Reinhardt’s class on the politics of Southeast Asia convinced me America’s military involvement in Vietnam was a tragic mistake. My one regret over those four years — and it’s a deep one — is that I studied just to get by in too many classes and that I took so little advantage of what the University had to offer. “Education,” my father once told me (I believe after he had received my report card for a semester), “is the only commodity we buy and are content not to get our money’s worth from it.” I paid no attention at the time to that observation — likely because it was his money paying for my education — but I should have. As a reporter in North Carolina and Washington, D.C., I frequently grappled with business and economics subjects, which I ignored in college. For two books I wrote on World War II espionage, I had to pay thousands of dollars to have captured German military intelligence and Gestapo documents translated. (I had retained embarrassingly little from my German classes.) For another book I wrote on a U.S. Navy submarine, the vessel’s executive officer had to tutor me in geometry and trigonometry so I could describe for a lay reader how the crew used math to plot an enemy sub’s position for a torpedo attack. When I give talks to students, I’m sometimes asked what they should study to become a writer. “Everything,” I answer. I did not graduate from Wake Forest in 1971 an educated person. I imagine my professors would have been horrified at any student leaving the University content with what he or she had learned in just four years. No, my education continued over the next 47 years. But the fleeting time I spent on an idyllic college campus in North Carolina’s Piedmont Triad planted a seed, lit a spark, stirred a hunger in me, for which I will always be grateful. I imagine my professors were happy accomplishing that much. 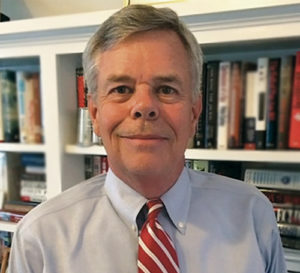 Douglas Waller (’71, P ’03) is a former correspondent for Newsweek and Time magazines and the author of seven books. He was inducted last fall into the Wake Forest Writers Hall of Fame. His next book, on Abraham Lincoln’s spies, will be released by Simon & Schuster.